Yahtzee: Last chance — I'll just keep tanking the rakes and maybe I'll somehow become really psychotically into being rake-faced just in time to be prepared for the sequel. And I'll be blatted in the face with a rake if that isn't kind of what happened! Common in cartoons, an innocuous-looking rake (or hoe, or shovel...) is lying on the ground. A character steps on it the wrong way and gets a face full of the stick part. Ouch. Obviously Truth in Television for anyone who tried that. In real life, however, it usually results in a nosebleed or, if bad enough, a trip to the emergency room — Looney Tunes jokes notwithstanding. And if an actual rake fails to rise and smack you, it may instead hurt your foot and/or break the rake. Tenchi Muyo! Ryo-Ohki: Subverted in the first episode when Ryoko steps on a metal rake. She doesn't get hit in the face, instead she's fast enough to dodge and then smack the pole hard enough to bend it. This, however, leaves an opening for Tenchi to slice her wrist off. The Far Side has the African Rakesnake. One strip ◊ has John being victim of two of these. Before that, Garfield himself was subjected to one in a 1985 strip. One of the bad things happening to Jon in this strip. U.S. Acres: Wade believed that, if he were fast enough, he could race right by danger before it could do anything to him. A rake proved him wrong. A variant occurs in Calvin and Hobbes: The Series: one-off criminal Tom accidentally steps on a shovel that his partner Bill is running on, leading him to get this trope. It's heavily implied that it was a Groin Attack as well. In Ice Age, Sid the sloth walks on something in the abandoned human camp and gets whacked in the face. In Encino Man, Link steps on a rake shortly after being thawed. A variation happens in National Lampoon's Christmas Vacation, when Clark keeps stepping on loose floorboards in the attic. In The Pink Panther Strikes Again, Dreyfus, while trying to avoid Clouseau, steps on one, causing him to fall over in the water. Subverted in The Goonies; after Stephanie and Andrea step on the rake it doesn't hit them in the face but pops up with a fish head on the other end. One of the hapless teens (Jason Buuck) in Hobgoblins 2 steps on a rake after being distracted by a girl pretending to flash him, leaving him a bit dazed . Grandma's Boy: Harold Lloyd manages to do this twice in a row while creeping around a barn in the dark, looking for an escaped criminal. A humorous aside in the Ciaphas Cain novel The Traitor's Hand notes a group of monks injuring themselves stepping on discarded gardening tools while fleeing from an unexpectedly-landing shuttlecraft. Seems even in the grim darkness of the 41st millennium, this joke still happens. Equal Rites references this, saying that magic has a habit of lying low, like a rake in the grass. In Going Postal, part of the Postman's Walk involves navigating an obstacle course where one risks stepping on a rake, a roller-skate, and/or an empty beer bottle with a hood over one's head. "Postmen, what is the First Oath?" "Strewth, would you bleedin' credit it? Toys, strollers, garden tools... they don't care what they leaves out on the path on these dark mornings!" Happens to the Skipper on the Gilligan's Island episode "Waiting for Watubi"; the "rake" was made of bamboo and coconuts. Happens to Jack a couple of times on Three's Company. On 1000 Ways to Die, one young woman who gardened as a hobby died of suffocation by stepping on a rake with a zucchini in her mouth as she prepared for a date. In The Late Show with David Letterman's Top Ten List of the most dangerous toys (from November 1997), Number 8 was "'Ouch!' The Step-On-A-Rake Game". It's a common gag on The Benny Hill Show, usually coupled with Groin Attack with a shorter rake. Robert Frost wrote a little comic poem about this, "The Objection to Being Stepped On ." Teenage Mutant Ninja Turtles: Turtles in Time has loose planks on the pirate ship level that smack the player character whenever they step on them. It's the same gag. This happens to Guybrush in Monkey Island 2: LeChuck's Revenge. Plants vs. Zombies allows you to buy a rake for your lawn that kills the first zombie that it encounters; it lasts three levels, after which you can buy a new one. A rare level hazard in Buster's Hidden Treasure, a Tiny Toon Adventures game for the Sega Genesis. In some levels, enemies can attack you while the rake has incapacitated you. One of the rake-type traps is present in Runescape in Isafdar forest. However, this trap has something else than just a stick at the end of the rake. This can happen to Pac-Man in Pac-Man 2: The New Adventures at the farm. Pepsiman has shovels that Pepsiman can step on and get smacked in the face by. In Delicious 9: Emily's Honeymoon Cruise the title character has a fight with her husband while on a Greek beach and after she storms off he steps on a rake and gets knocked out. Stepping on a rake is a minor hazard in Sunsetriders that causes comical effects (a big vertical indention on the face for Billy, Steve and Bob, while Cormano ends up taking a shot to the junk). In Skylanders: SuperChargers, Cloudbreather's Crag has rakes that will hit your Skylander if they step on them, though otherwise they're harmless. Outside of the level, you can buy one as a Legendary Treasure for use at Skylanders Academy. Lakeview Cabin Collection feature rakes in Part III that the players can step on, being whacked with enough force to knock them off their feet. Which can also be weaponized against the killers. In Hitman 2, you can set this up in the Whittleton Creek level by placing rakes down on the ground. If anyone walks into them, they'll get smacked on the face and get knocked out. Torg: [Thinking] Alone, surrounded by vampires. My only hope is to dive for the rake by my feet, breaking the shaft into a wooden stake. But how am I going to find it in this mist? Shortpacked! uses it on Batman , relying on his intelligence for extra humor. Yahtzee described his initial experience with Dark Souls as being like "walking into a dark shed full of rakes: immediately treading on one and getting blatted in the face". The probes in 17776 lament this tropes aversion via nanorobotics that protect humans from injury. Tom the cat gets it frequently in Tom and Jerry. This happens to Sideshow Bob a lot in The Simpsons, particularly in the "Cape Feare" story where he repeatedly stepped on a bunch of rakes in a row. Hanging onto the bottom of a car after it went through a bunch of cacti apparently left him too out of it to even notice how they were all there completely littering the ground. In the DVD commentary, the creators admit they were filling for time. Once Sideshow Bob actually gets on the boat Bart is on, he's decked by one last rake. 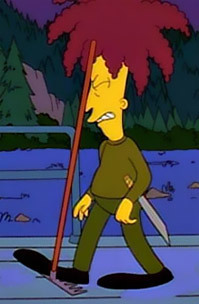 Sideshow Bob is so mad by this point that he chucks the rake overboard. It becomes a Running Gag or possibly even a Brick Joke in later episodes. Bart: I thought I was your arch enemy? Monster Allergy has it with Bombo in the opening theme of season 1. In one episode of Garfield and Friends, Wade Duck, worried about being arrested for ripping a mattress' tag off, bumps into the rake he is using trying to sew on the tag. And then this happens. Once happened in Mullewap (a farmstead where a detective trio consisting of mouse, a pig and a rooster solve minor crimes). A chicken lies unconscious in the hay. The fox gets jailed as the usual suspect, but for once he was innocent which is clear when the rooster runs into the rake himself. In the Maw and Paw cartoons, there is a loose floorboard on their front porch that hits Paw in the face anytime he steps on it — and only if HE steps on it. In Yankee Doodle Bugs, Bugs Bunny does this, and the resulting stars circling his head are what give Betsy Ross the idea of putting them on the U.S. flag. Or that's how he explains it to his nephew Clyde, anyway. Happens to Scarecrow whilst chasing a weasel in The Magic Adventures of Mumfie episode "Pop Goes the Weasel". In the Action League Now episode, "Meltman at Large", on his way to save two kids trapped in a tree, an enlarged Meltman steps on a rake and gets hit by it.